The statue of Ya Mo had been pointed out on the map by the reception staff at the Dusit Princess Hotel, so on day 2 we again headed off to town. By now the novelty of walking had worn off a bit so we crossed over Suranai Road and waited for a songtaew to come along that looked like it was going where we wanted. Actually we had no idea which songtaew to get and just took a chance on the first one that came by. Fortunately it went to the centre of town and it stopped just over the moat. We got off and paid 16 Baht and continued walking until we got near to the statue of Thao Suranari or Ya Mo. 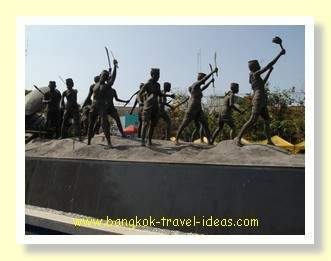 In this area of the town centre there are tributes paid to the battle between Thai and Lao forces in which Ya Mo is credited with the overthrow of the invading Lao army in 1826. In the pedestrian precinct there is a depiction of the battle made in bronze just opposite a small museum. 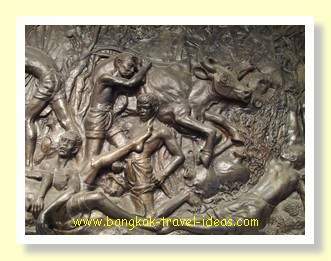 Inside the museum, one wall in bas relief recreates the scene at the time with Ya Mo at the centre. 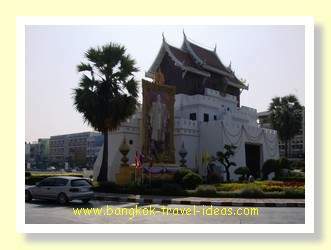 On the other side in a large glass case is a miniature model of the events and depiction of Thai life in that period. You may miss this large white building as it is constructed to look like part of the fortifications and the door way is very small. It is free to go inside and look at the exhibits and opens each day, except Monday from 10:00 to 18:00. Leaving the museum and walking a little further on, it was clear that this central location was being set up for the New Year festivities, with loud speakers and stage construction all going on. Walking a little further we came to the statue of Ya Mo with people paying their respects to her memory. Here you can buy incense sticks and Lotus flowers for a 20 Baht donation. If you decide to participate then take off your shoes before stepping onto the raised area. The statue of Ya Mo is a popular place for photographs to be taken and there are a number of professional photographers walking around that will gladly capture the moment for you. I had been on a day trip to visit the statue of Ya Mo 12 years earlier and had a photograph taken in front of the statue. When I returned home and compared the two photos, not much had changed; only me. This is a very busy part of the town and there a plenty of places to eat. Lunch was enjoyed in a noodle shop across the road from the Ya Mo statue. 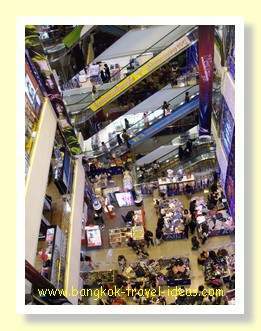 After eating and paying the bill of 140 Baht we went to the nearby large multifloor department store for a walk around to look for some gifts and a clutch bag. 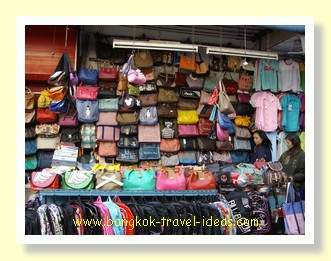 You would think that it would be quite easy to find a clutch bag in Thailand. Well, it is not that easy, there are lots of designs, but they were either too big or the wrong colour or not hi-so enough. One stall had hundreds of bags, but it did not have just the right one. 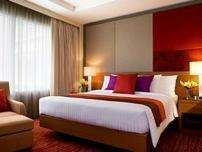 After exhausting all the brand name stalls in the shopping mall and still not finding one we headed back to the hotel. This time to be sure of getting the correct songtaew we walked back to the main road, across the moat and waited. It was a bit hit and miss really, as we had no idea where the individual songtaews went and had to confirm with the driver before getting on board. Don’t worry about getting the wrong songtaew, because the worst thing that can happen is that it doesn’t take the correct turn off. In that case just ring the bell, get off and get on another one. Back at the hotel we took the opportunity to sit by the poolside. Once again we were on our own. 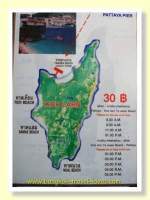 I can’t imagine many people come here for their holidays. As the sun started to set we headed up to the small shopping centre to pick up a couple of beers and dinner was eaten by the side of the road, again for the amazing price of 240 Baht. The day was really nothing special, nothing fantastic but just relaxing. 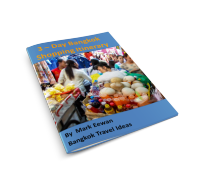 If you enjoyed reading my Thailand travel diary then explore more excitement in Korat on Day 3 or just jump to a different day using the links below. 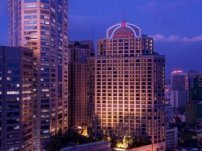 Leave Bangkok in the early morning and set off by car to go to Nakhon Ratchasima, the largest city in the Northeast of Thailand. 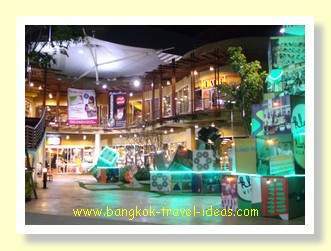 The town located about 4 hours from Bangkok and is the gateway to the Isaan province.